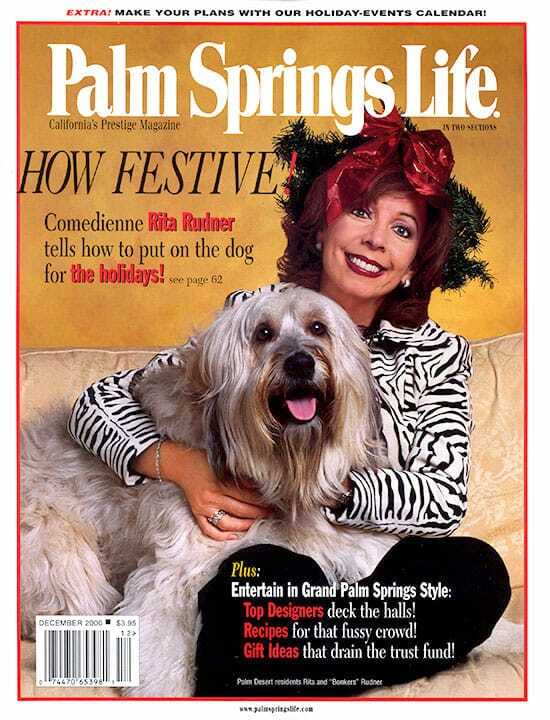 ON THE COVER — Harry Langdon used to shoot all of Frank Sinatra’s cover photos for Palm Springs Life. 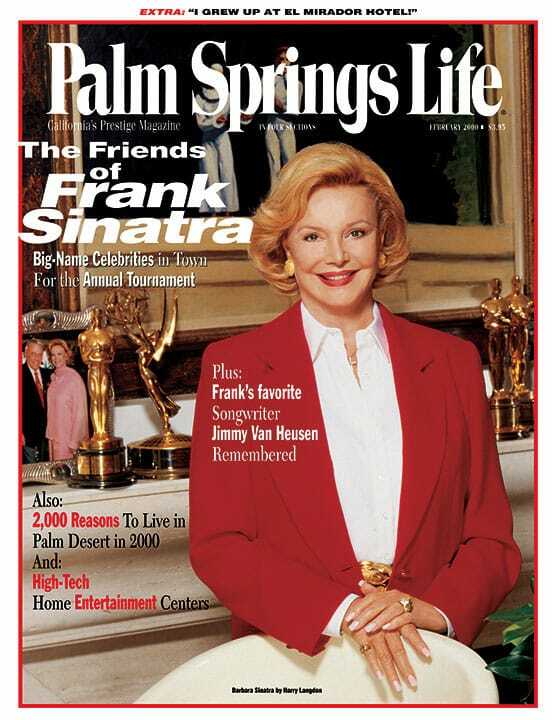 This month he returns with this stunning portrait of Frank’s widow Barbara, as well as photos of Kirk Douglas inside. By Gloria Greer. Memorabilia from Marty Newman. He was Frank Sinatra’s favorite songwriter (“I Thought About You,” “Polka Dots and Moonbeams,” “High Hopes,” “All The Way,” “Pocketful of Miracles”). More than that he was Sinatra’s role model. “Frank wanted to be Jimmy,” the saying went, “but he couldn’t pass the physical!” We’re reprinting here the timeless profile of the composer by Gloria Greer from Palm Springs Life, April 1962. And Gloria has updated us on Van Heusen’s final years. Nice nostalgia. By Susie Coelho Photography by David Glomb. Our famed lifestyle columnist takes us into the arcane world of home entertainment where digital TV, satellite dishes and powerful speakers can turn the living room into a mini-multiplex. Los Angeles-based designer Jeffrey Hitchcock designs a home in Rancho Mirage using influences from all hemispheres. By Freeman F. Gosden, Jr. Illustration by Stuart Funk. Photography courtesy Palm Springs Historical Society. Gosden’s father was one half of the famed “Amos and Andy” comedy team which broadcast its popular CBS Radio show from Palm Springs in the 1930s. Freeman Jr. had free reign at El Mirador Hotel and, like Eloise at New York’s Plaza, got close to all of the staff and famous guests. (The notorious Mrs. Simpson from Baltimore, for instance, snuck him cookies at lunch.) A fun read. There’s a reason why the city of Palm Desert has grown so quickly. Actually, there are more than 2,000 reasons to live in this great valley town in the year 2000. Read all about it in this annual edition. 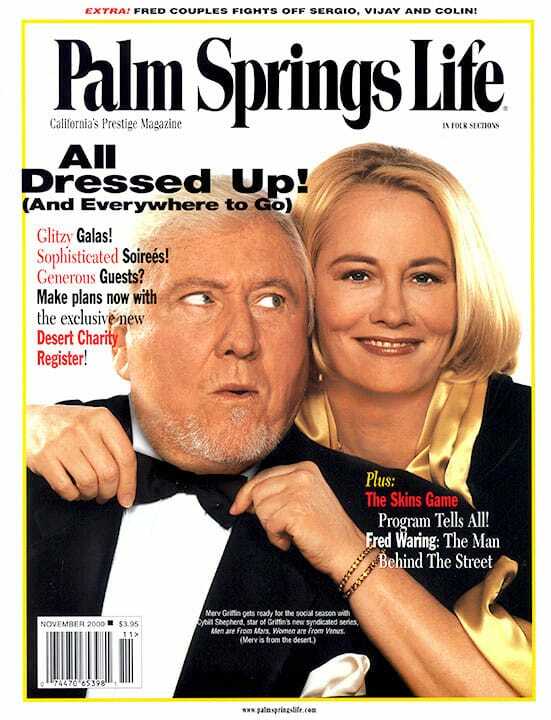 Also: important city phone numbers and addresses and a look at the high fashion of Palm Desert. For a dozen years, the golf tournament begun by Mr. and Mrs. Sinatra has raised funds to help the Barbara Sinatra Children’s Center. This year celebrity co-host Kirk Douglas and singer Barry Manilow join the effort.